In the days before broadband Internet connections, surfers would have to wait a long time on dial-up for images and pictures to load on a web page. By disabling images, surfers were able to save money on bandwidth charges and save time by picking and choosing which images to download and which to ignore. Even in a world of almost universal broadband connections, the benefits of disabling images in IE8 still have merit no matter how fast your connection. This is especially true since some Internet service providers are beginning to experiment with eliminating unlimited Internet connections and charging customers a rate based on bandwidth usage. 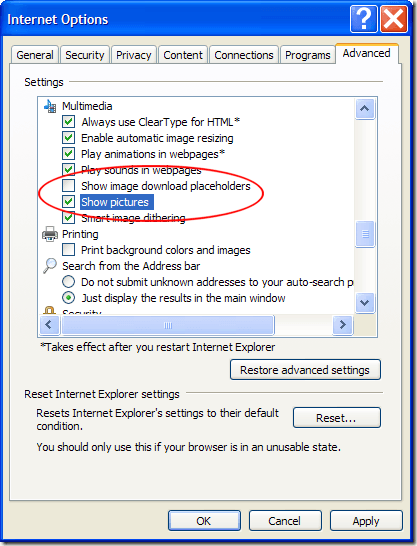 Disabling images in IE8 is a simple procedure. 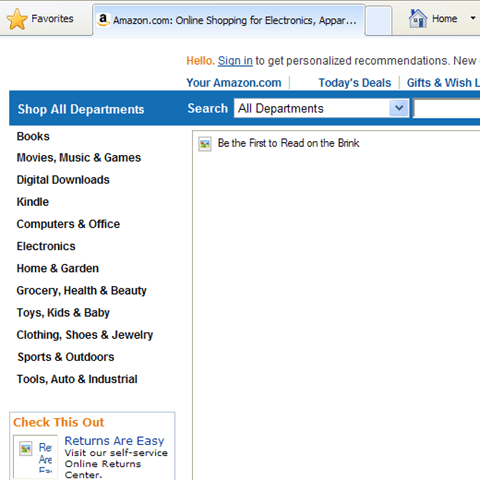 First, click on Tools>Internet Options and then click on the Advanced tab in the Internet Options window. In the Settings pane, locate the section labeled Multimedia. Here you need to change two options. Uncheck the Show pictures option and check the Show image download placeholder option. Click the OK button for these options to take effect. You will notice that whenever you surf to a web page, the images do not automatically load. In their place, you will see what’s called a placeholder where the image would have loaded if you allowed IE8 to display images. 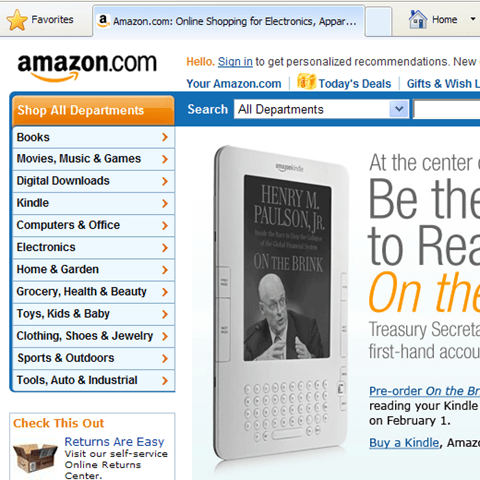 For example, in the screenshot below, notice that this part of Amazon.com’s frontpage displays normally when you have images enabled in IE8. 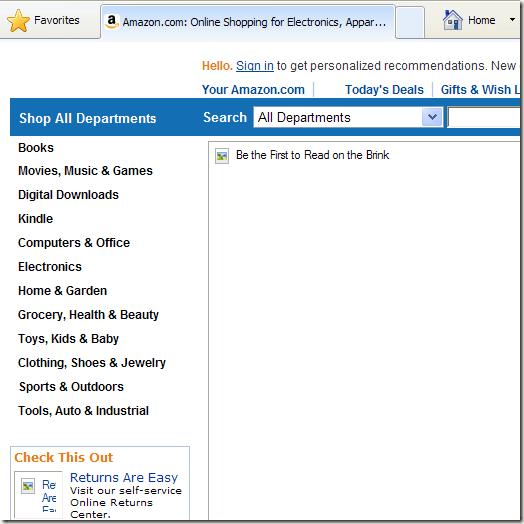 In the next screenshot, you see what Amazon.com looks like when you disable images in IE8 and the placeholders show up instead of the pictures. 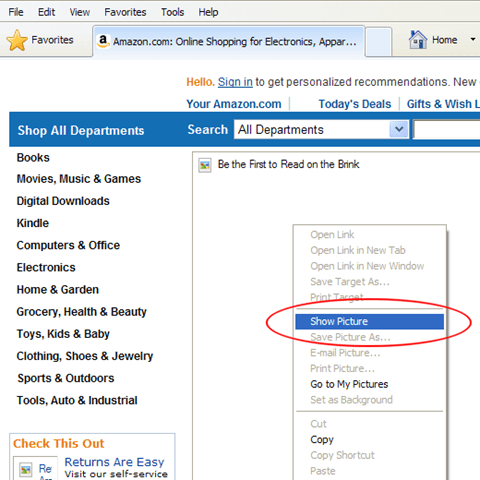 Fortunately, IE8 does not force you to either have the images load or not have the images load. 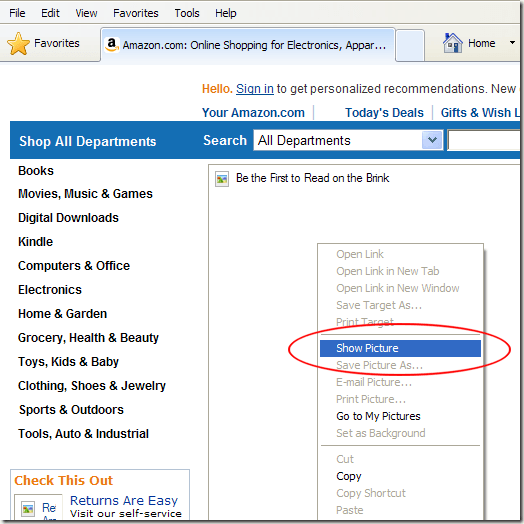 You can override your decision to suppress images from downloading and displaying by right clicking on any placeholder and selected Show Picture from the pop-up menu. 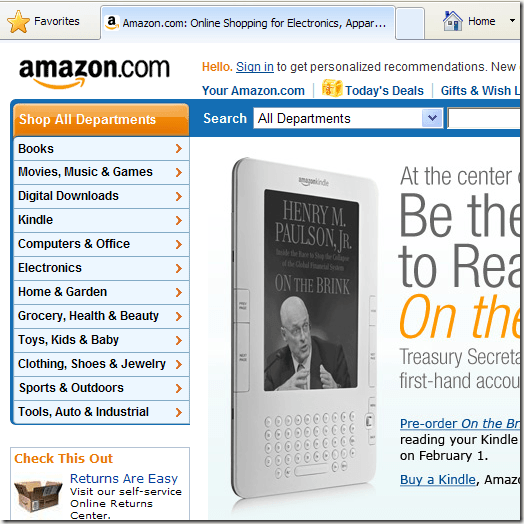 This style of web surfing carries with it several advantages. First, if Time Warner and other ISPs begin to charge customers per bandwidth usage, this trick can significantly reduce the amount of information you download on the Internet resulting in a lower bill. Second, if you are doing research on the Internet, you may find that disabling images in IE8 allows you to focus on your task and avoid the distraction of looking at extraneous images. You may also find that your children will spend more time on task when using the Internet for school assignments. Without those pesky images to distract them, your kids can get down to work and not use homework time for entertainment time. Finally, some Internet users actually prefer this minimalist style of surfing the web. What is stoic to some is a break from the advertisements, “click here” teasers, and other distractions displayed in web images to others. Give it a try and tell us what you think about disabling images in IE8 and surfing the web free from distraction.